The Physics & Astronomy Department’s Bullitt Lecture is a free lecture aimed at the general public. Since 2001, the Physics & Astronomy Department’s Bullitt Lecture has presented a distinguished astrophysicist to a Louisville audience in the Gheens Science Hall and Rauch Planetarium. Gale Christianson, Hubble's biographer at Indiana State, Fred Espenak, an eclipse expert at NASA Goddard Space Flight Center, stellar astrophysicists James Kaler of U. Illinois, C. R. O'Dell of Vanderbilt and Caty Pilachowski of Indiana U, cosmologists Fang Li Zhi of Arizona, J. Richard Gott of Princeton, Alan Dressler of the Carnegie Observatories and lunar experts Ferenc Pavlics of GM and the Apollo project and Phillip Abel of NASA have been Bullitt Lecturers. College and high school students, teachers, and many others from the community interested in the impact and excitement that astrophysics has generated have attended Bullitt Lectures in large numbers. The public and members of the University community are warmly invited! The Lecture is endowed through a grant from the family of William Marshall Bullitt, the Solicitor General of the United States under President William Howard Taft. Here is a brief biography and description of his connection to the University of Louisville. Parking: available from 5pm, North Info Lot and Red Reserved Lot at the College of Business (gates will be up). Parking will also be in the Speed Museum parking deck and in the lot at 4th St & Cardinal Blvd (both for a fee). On Aug. 21, 2017, a total eclipse of the Sun will be visible from the contiguous United States for the first time since 1979. The track of the Moon's shadow cuts diagonally across the nation from Oregon to South Carolina. Inside the 68-mile-wide path of totality, the Moon will completely cover the Sun as the landscape is plunged into an eerie twilight, and the Sun's glorious corona is revealed for over two minutes. Dr. Espenak will present a detailed preview of this exciting event with maps, photos and weather prospects along the eclipse path based on his recent book on the same subject. He will also share some of his eclipse experiences with us through photos and video. Find out what it's like to stand in the Moon's shadow, and get ready for 2017! 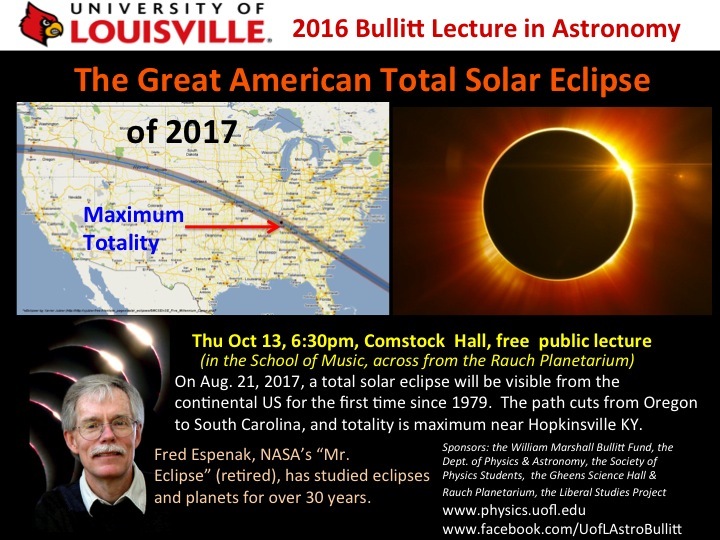 We will have a ringside seat, because maximum totality will be near Hopkinsville, Kentucky. Start planning your trip to see the eclipse! Over the past 45 years, he has witnessed 26 total eclipses of the Sun. In 2003, the International Astronomical Union honored Dr. Espenak by naming asteroid 14120 after him. He now lives in Portal, Arizona, where he operates Bifrost Astronomical Observatory. We will record the lecture for our talk archive.